Fredheim is a lifestyle and wellness center that helps you towards a renewed health – a unique offer for those that are not satisfied with just treating symptoms, but who wish to prevent or treat the cause of illness. The place has a relaxed atmosphere and lies in beautiful and quiet natural surroundings just outside of Kongsberg, with a nice view towards the Skrim mountain. Here you can find rest from the daily hustle and bustle, go on trips in forrest and plains with guides or alone, listen to educational presentations and de-stress with massage, jacuzzi and sauna. Fredheim saw the light of day in 1980, in the litte town of Skotselv, right in the middle of Hokksund and Åmot in Buskerud county. The place was small and had only space for 10 guests at a time. Due to high demand it did not take long until it was fully booked many months ahead of time. After seven successful years, we got in 1987 the opportunity to buy a place that had previously been a treatment center for asthmatic children. It’s a place surrounded by gorgeous pine forrest and know for its healthful air quality. This place was considered ideal for a growing lifestyle center and we have been there ever since. During our over 35 years of operation we have developed a very effective program that has given oss the competence to help many with various lifestyle diseases. Our core program is called NEWSTART and emphasises a life in balance when it comes to nutrition, exercise, water, sunshine, temperance, air, rest and trust – which we call the eight health keys. Our focus on both theoretical and practical education makes it easier for you to achieve your own goals after your stay here. Our speciality is a 100% plant-based diet which includes much appetising raw food and warm meals, which we get a lot of good feedback on. 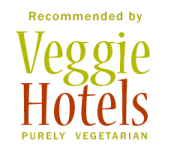 Our guests often think it is amazing that a plant-based diet can taste so good. Have you been inspired by your Fredheim experience and wish to share your enthusiasm with others? Gather a group of friends/interested people who wish to experience a taste of Fredheim – then we can arrange a “health day” or a “health weekend” specially for you. Contact us if you think this sounds interesting. If you wish to support Fredheim financially you can make a bank transfer to our Norwegian account: 1594.02.31997. We are open for your ideas – feel free to contact us for a partnership.